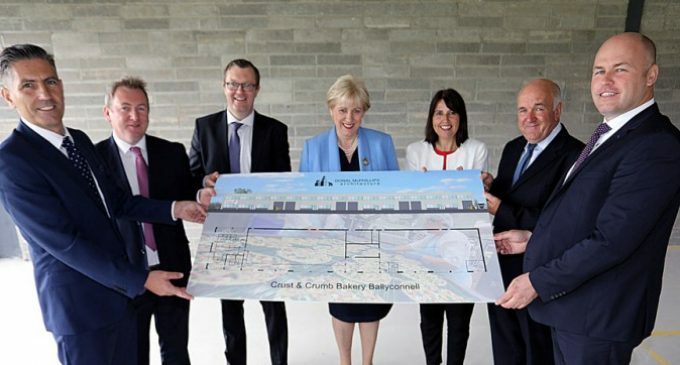 Crust & Crumb, the manufacturers of chilled pizzas, pizza bases and flat breads, has announced plans to build a new, state-of-the-art factory in Ballyconnell, County Cavan. A total of €5 million will be invested in this new facility, which is supported by the Government of Ireland through Enterprise Ireland. The development of the company into its new location at Ballyconnell will enable expansion into the large and growing chilled pizza market in mainland EU countries. Approximately 80 full time jobs will be created at the facility. Crust and Crumb Bakery Limited (NI), the parent company, supplies retailers with chilled pizzas, pizza bases and flat breads and has been in operation since 2011. It operates two premises in Derrylyn, County Fermanagh, with a total floor area of 25,000 sq ft. One of these is dedicated to gluten free products, the second plant manufactures all other products in the portfolio. The portfolio of products includes ranges of chilled pizzas of various shapes and sizes, generally as Retailer Luxury Private Label with the use of novel bases such as pea flour bases to satisfy demand for low-carb, high protein pizzas for the likes of the Muscle Food brand. Pictured (L-R): Kevin Buckley, Manager, Food FDI Europe, Enterprise Ireland; Aidan McKenna, Regional Director, Enterprise Ireland; Mark Christal, Manager, Regions and Entrepreneurship, Enterprise Ireland; Minister for Business Enterprise and Innovation, Heather Humphreys TD; Jill Griffith, Financial Controller, Crust & Crumb; Garrett Dee, Senior Development Advisor, Enterprise Ireland; and Mark McCaffrey, company spokesperson, Crust & Crumb.